Experience South Africa's largest city - financial and commercial heart. It is in Johannesburg city that the country's radical political and social transformation is most evident - this is the "Rainbow Nation" at work. - Visit Constitution Hill home of South Africa's Constitutional Court and site of the Johannesburg Old Fort Prison (closed Sat & Sun). - Scenic drive through the newly renovated quaint suburb of Melville. - Stop at Newtown Market where a unique variety of African arts and crafts are for sale. - Visit MuseuMAfrica: the innercity's soul reminiscent of a 1950's shebeen Johannesburg's premier cultural history museum. 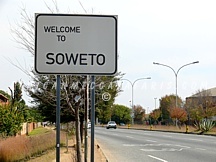 Soweto - acronym for South Western Township, is home to over 2 million people who, despite living in crowded and chaotic conditions, have a tangible sense of community, which the ordered, walled northern suburbs lack. - Visit the Hector Peterson Museum discovering the cause of the riots. - Pass the Mandela House, giving you the option to visit this small museum (own account). - Visit Regina Mondi Church, site of many underground meetings of the then banned political parties. Apartheid was dismantled more than a decade ago with the liberating of black and colored South Africans in 1994 but its history lives on in a stark white building in Johannesburg. 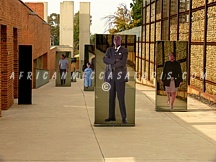 It is the Apartheid Museum (Soul Of South Africa) with the motto "A HISTORY FORGOTTEN IS A FUTURE LOST". The museum takes its visitors on a journey of the rise and fall of Apartheid which damned its victims to a life of servitude, humiliation and abuse, then rising to a nation of resistance, fortitude and courage. - Enjoy a full day tour of South Africas struggle to democracy which has been so well documented in many diverse museums and places of interest. 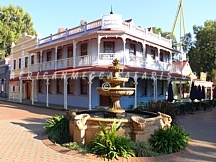 A reconstruction of Johannesburg during the Gold Rush era, Gold Reef City is home to a Victorian Fun Fare and is designed to replicate an era of the Gold Rush Experience. 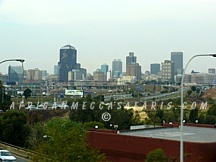 - An organized tour, 'Jozi's Story of Gold', takes you through the many attractions on offer. - Enjoy a performance of gumboot dancing routines, devised decades ago by mine workers. - Take a trip down an old mine shaft and get a sense of the tough working conditions miners had to endure. A safari visit to the Pilanesberg National Park with an opportunity to experience game viewing the 'Big Five' and other diversity of wildlife/ecology. Thereafter, continuing to one of South Africa's most popular theme resorts Sun City. 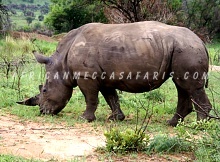 - Guided closed vehicle game drive within Pilanesberg National Park, in search of the 'Big Five' and other animal species. - Visit Sun City, with access to the casino. Access to the wave, swimming pools and guided tour of 'The Lost City' is optionally available - payable directly. An exploration of imposing Museums and Monuments, dedicated to tracing South Africa's extraordinary history. Pretoria is also known as the 'Jacaranda City', for its beautiful purple lined streets when the jacaranda trees are in full bloom. - A visit to the Voortrekker Monument, a memorial to the early settlers. - Kruger Museum - private residence of president Paul Kruger of the old Transvaal Republic. - Visit Church Square, surrounded by buildings dating back to the turn-of-the-Century. - The Union Buildings an architectural masterpiece and scene of Nelson Mandela's emotional inauguration as president in 1994. An afternoon/evening tour of discovery at the Lesedi Cultural Village, home to families of various African tribes, living in traditional homesteads. - Discover the Zulu, Xhosa, Ndebele, Sotho and Pedi cultures. - Multilingual, multi visual orientation depicting the history of South Africa. - Enjoy a traditional African meal.